I read somewhere that it’s best not to microwave your foods because it kills nutrients. I still make microwave popcorn, but I try not to use it for most other things. However, potatoes and squash almost always end up in the microwave. I mean, who has time to roast them for 45 minutes or longer?! I wanted to make my kids a dip with sweet potato in it, and I thought I’d give the solar oven a crack at it. 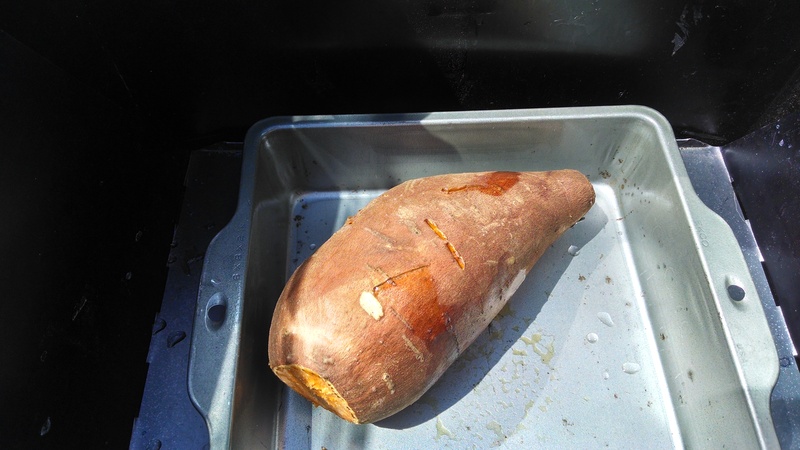 I poked holes in the yam (I know it’s not a sweet potato, but it was on sale) and roasted it uncovered for a few hours while I ran errands in the morning. It turned out perfect! It was hot and soft and I didn’t have to heat up the kitchen or stand around at home waiting for it to be done.